We feel that a great way to start your journey is from our little village of Fintry. It is nestled in the foothills of the Campsies and is in a great position to take advantage of Stirling, Loch Lomond, Cairngorms, Glencoe, North Coast 500, Skye and many, many more places. 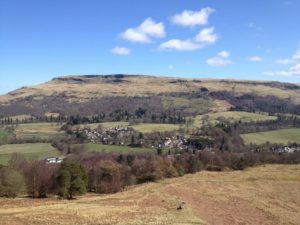 Please view our blog with information on what to see and do around Fintry. Below is options for transfers or public transport to Fintry from a variety of Airports in the central belt. Campsie Campers offers a meet at the arrivals gate transfer option for £80 each-way for up to 4 passengers which is the most time efficient and economical option for group bookings. Fintry is 1 hour drive from Edinburgh Airport. Alternatively, we can collect you at Stirling Train Station and transfer you to your camper in Fintry for £20 each-way for up to 4 passengers. Fintry is 25mins drive from Stirling. a) A tram to Waverly or Haymarket train station costs £6pp. Both train stations have regular trains to Stirling. b) Train tickets cost from £9.10pp and trains run every 30mins. Fintry is 1 hour drive from Glasgow Airport. a) The Airport Express bus to Buchanan Street Station has tickets costing £8pp. b) From here you can walk 5 mins to Queen Street Train Station and get a train to Stirling. Train tickets cost from £8.50pp and run every 10-20 mins. You can also get 2 x buses to Balfron and we will collect you for free. b) From here you can get a bus directly to Balfron every hour from £5.60pp. Campsie Campers offers a meet at the arrivals gate transfer option for £90 each-way for up to 4 passengers which is the most time efficient and economical option for group bookings. Fintry is 1 hour 20 mins drive from Prestwick Airport. a) The train leaves directly from Prestwick Airport to Glasgow Central Station and runs every 30 mins. You can pay your ticket on the train and sometimes are eligible for discounts when you show your boarding card.